The six-month administrative detention order against Palestinian Legislative Council (PLC) member and civil society leader Khalida Jarrar has been confirmed today, 17 July 2017, by a military judge. A confirmation hearing was held at Ofer military court, without the presence of Ms. Jarrar, who did not attend the court hearing. The military prosecution claimed that Jarrar's administrative detention is based on secret information related to her alleged affiliation with the Popular Front for the Liberation of Palestine (PFLP). 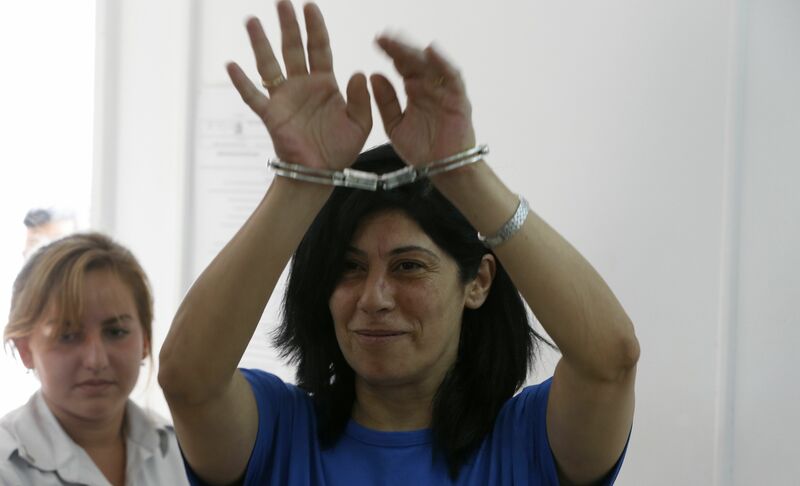 This claim was made without taking into consideration the fact that Ms. Jarrar is an elected Palestinian parliamentarian and a prominent human rights defender, who advocates for the rights of Palestinian political prisoners within Israeli prisons. Addameer's attorney visited Jarrar in Hasharon prison yesterday, 16 July 2017, during which Jarrar stated: "The occupying state does not respect the rights of Palestinian parliamentarians, their immunity, their right to be politically active and their right to freedom of expression. It takes arbitrary measures against PLC members that are not only limited to restricted movement and travel bans, but also arbitrary arrest and detention. This is a call for all parliamentarians throughout the world to raise their voices against Israeli violations and injustices, and to call for an end to the policy of administrative detention." Jarrar was arrested by Israeli occupation forces, who invaded her family homes in Ramallah city, in a pre-dawn raid on 2 July 2017. Jarrar, a civil society leader, has been a Palestinian Legislative Council Member since 2006, is head of the Prisoners' Commission in the Palestinian Legislative Council, and a member of the Board of Directors of Addameer Prisoner Support. Khalida Jarrar has been targeted by Israeli forces in recent years. She was released from prison in June 2016 after serving over a year in prison, including one-month under administrative detention.